Nasturtiums are my favourite plant ever – one of my earliest memories is of drinking rain drops out of their leaves (cause that’s how the fairies did it) and they’ve really stuck with me ever since. As I grew older I loved the fact the you can eat the leaves, flowers and make ‘poor man capers’ out of the seed pods, plus they’re a great living mulch in the garden, attract beneficial insects and easy on the eye. Over the years I’ve planted them in pretty much every house I’ve lived in and these days I have a giant mural of them on our bathroom wall. I even took it to the next level and requested that Anton (my now husband) sew my wedding dress so it depicted a nasturtium patch… And he did – it’s amazing, as is he. So when I found out that there’s a perennial nasturtium (called mashua) only less than a year ago – well, I got excited. 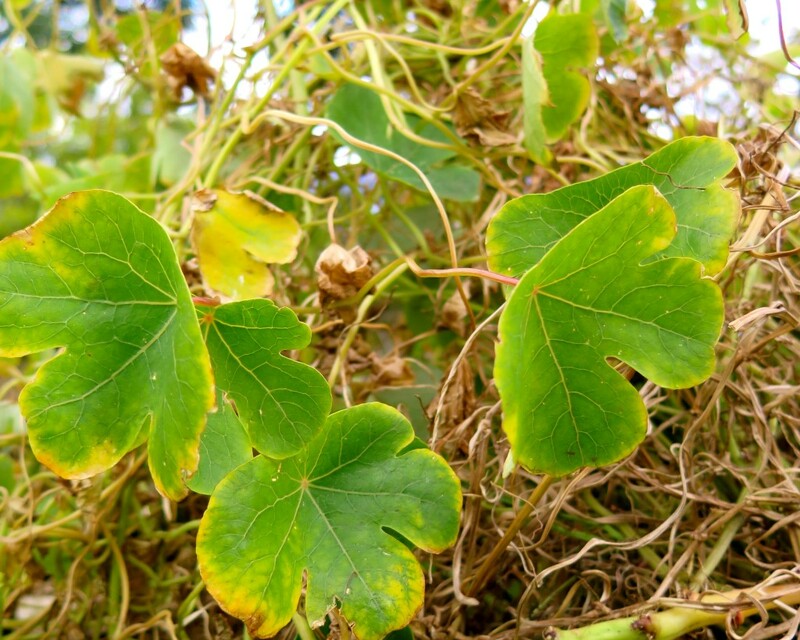 It’s official name is Mashua (Tropaeolum tuberosum) and it was traditionally grown in South America as a root crop. That’s right people, you can eat the leaves, flower AND TUBERS. I know, amazing. While it is a perennial, it’s sensitive to frost and cold so will die back in winter and grow fresh plants from new tubers in spring. 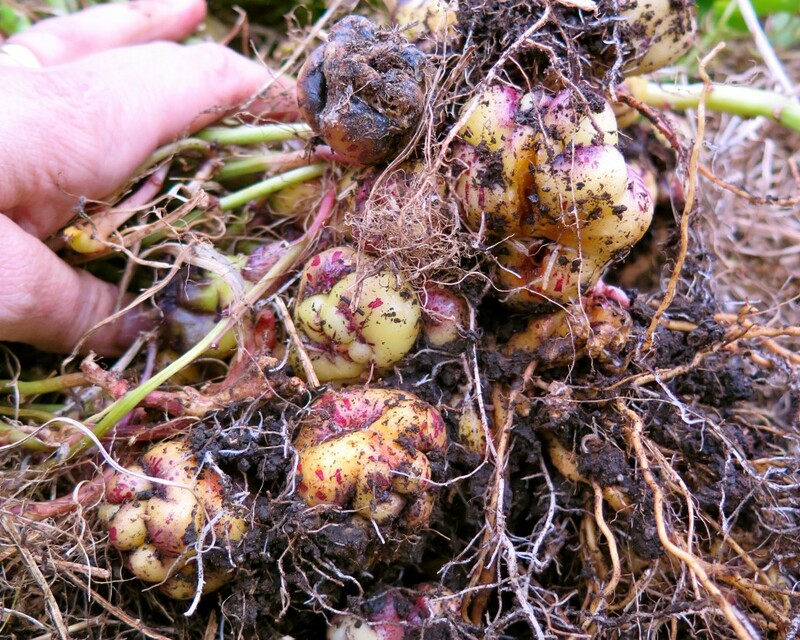 So late winter is the time to pull it up, subdivide all those tubers for eating and/or growing. 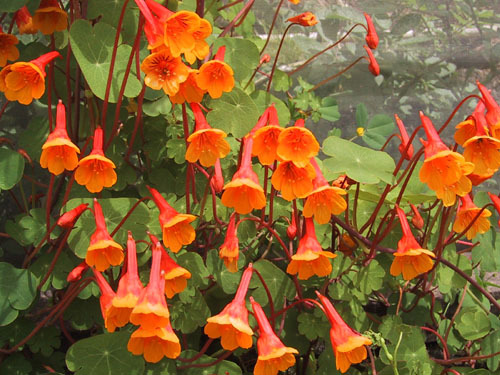 It grows rampantly as a climber or ground cover and the flowers and leaves are similar to the common nasturtium plant, but have their own twist. 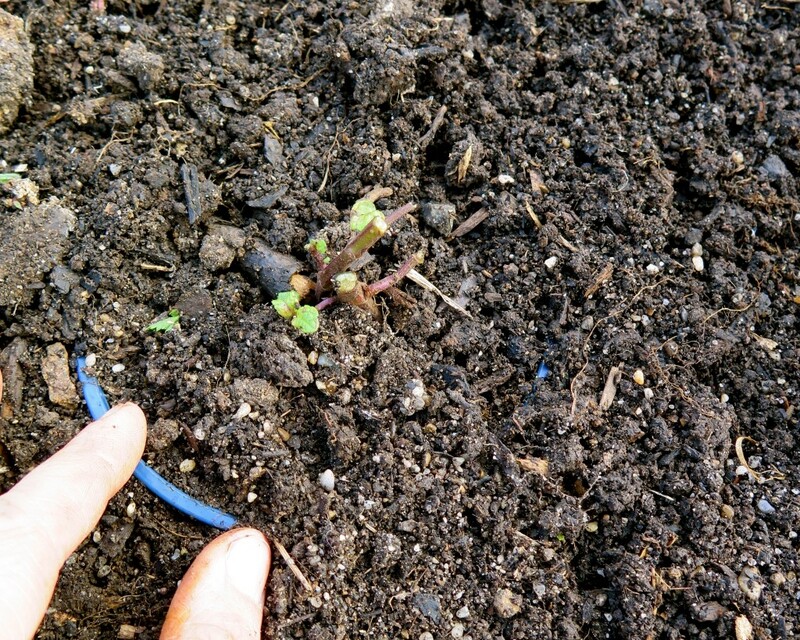 As this was the first time we grew the plant, we just watched to see what would happen. They spread out under our fruit trees, had a half hearted go at flowering (it was a bit cold) and then slowly started to shut down and go ‘green/brown’ as winter set in. 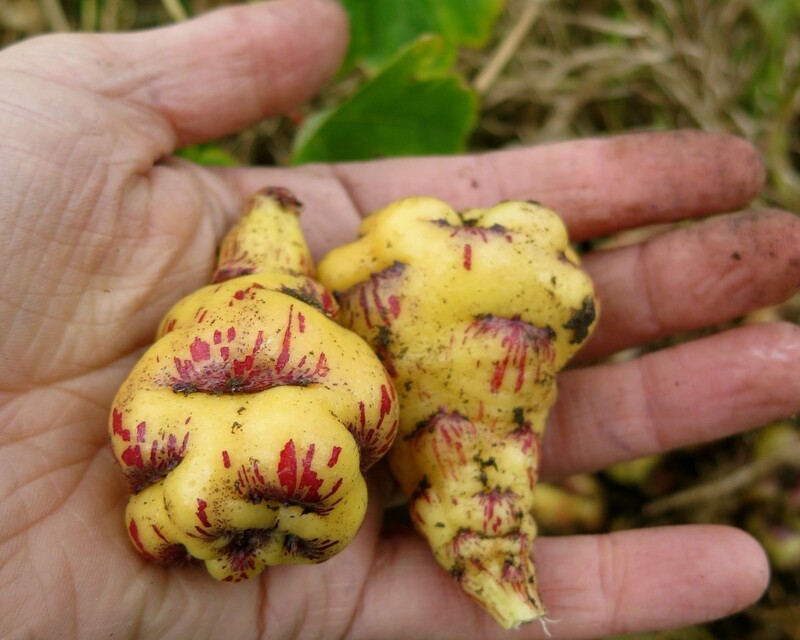 In recent weeks we started weeding the orchard and noticed a plethora of tubers at the base of each plant. 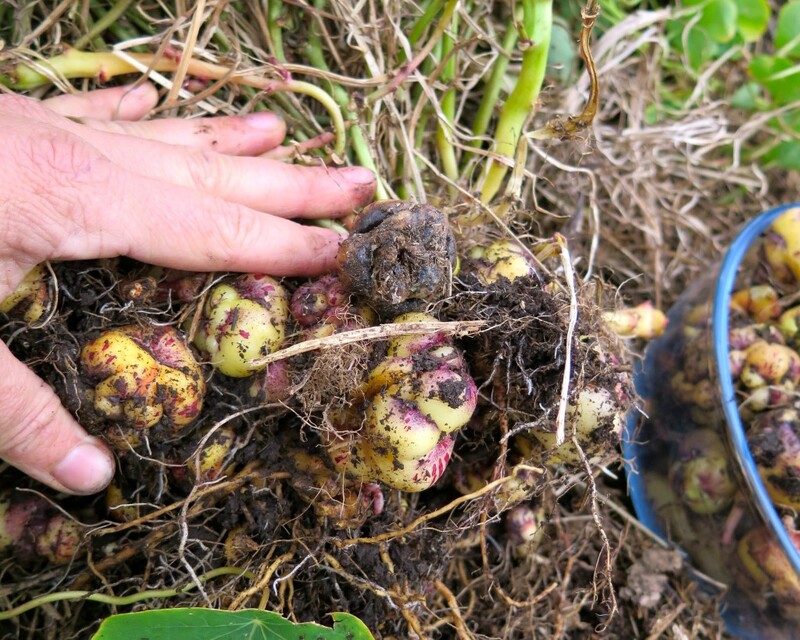 Up until then, we didn’t realise that (a) they had such prolific tuber production and, (b) you could eat them. It was a happy day of discoveries that one. So far we’ve only tried eating them roasted (just like potatoes), sadly we weren’t in love with their taste, but will keep trying different recipes until we are. And they’re beautiful, don’t you think? 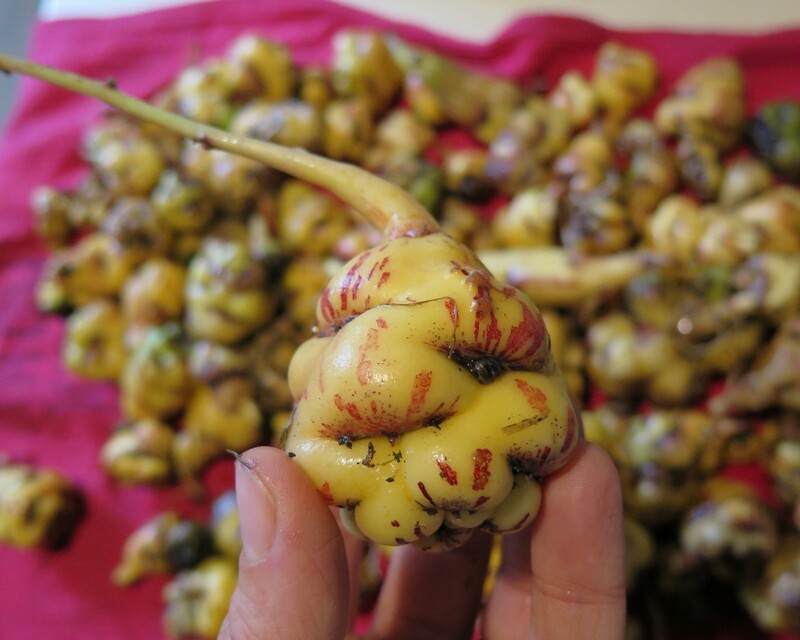 We’ve currently got a big bowl of them in our house and each friend who comes through leaves with at least one in their pocket to have a go in their own gardens. 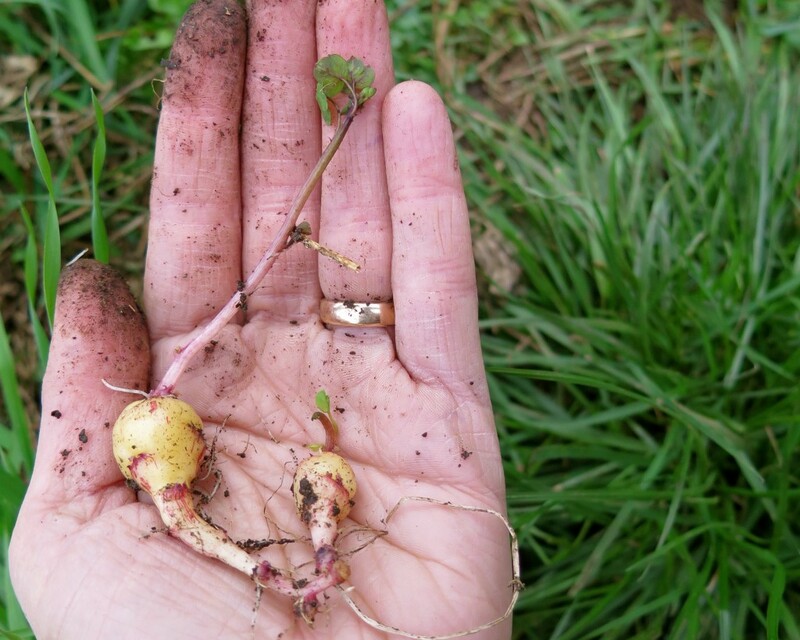 Plus we’ve sent some over to the Hobart City Farm to grow in their perennial beds. Gotta spread the love round. 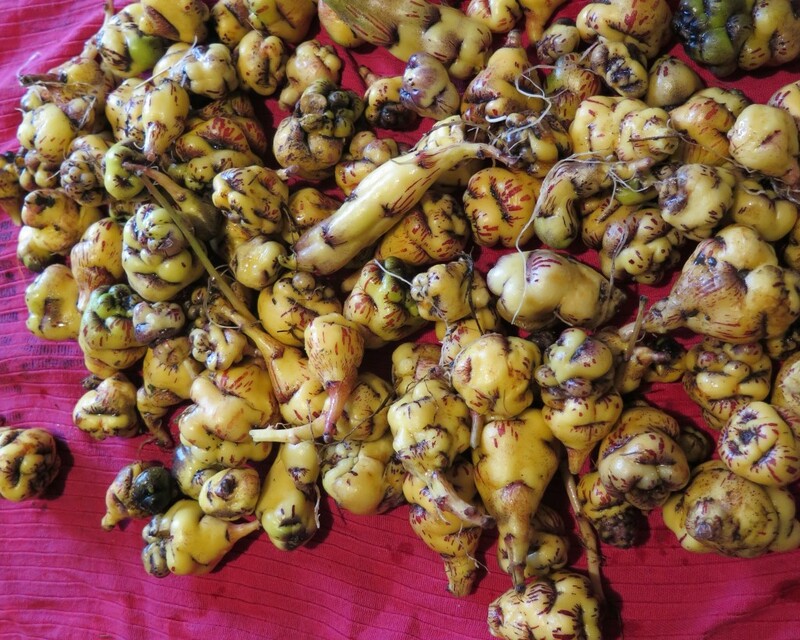 We’re feeling a bit ‘mashua rich’ at the moment – all this loot came from one plant. 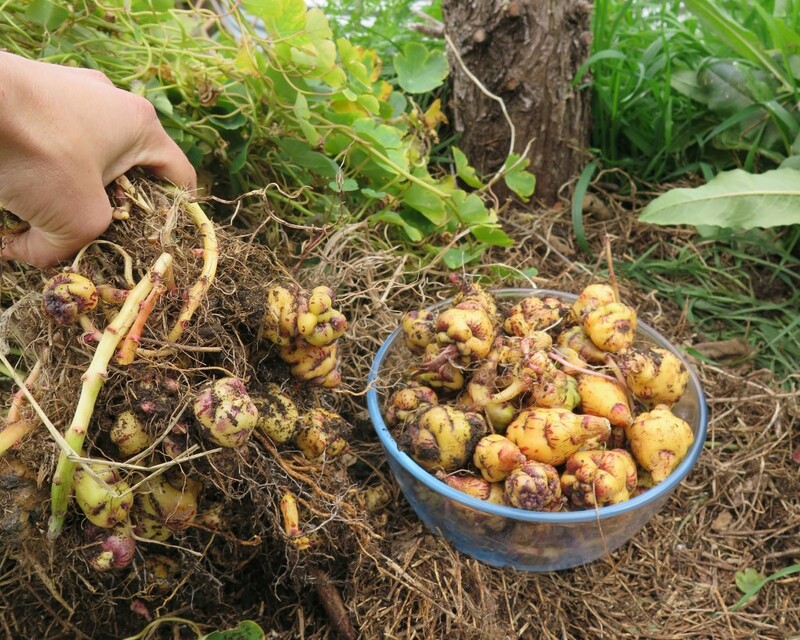 From what we can gather, mashua generally grows in a temperate climate and, like seed potatoes you can cut each one into smaller bits, with each one becoming its own plant. If you do this, just make sure each piece has at least two eyes (the dimply depressions) on it and that you harden them off so the cut can dry out and form a callus. Where can you get your own mashua plant? If you’re lucky enough to be in Tasmania, visit Provenance Growers at the Hobart Farm Gate Market and they’ll sort you out. If you’re in the US, I found this fantastic mob called Cultivariable who stock it, plus a million other great, lesser known food plants. 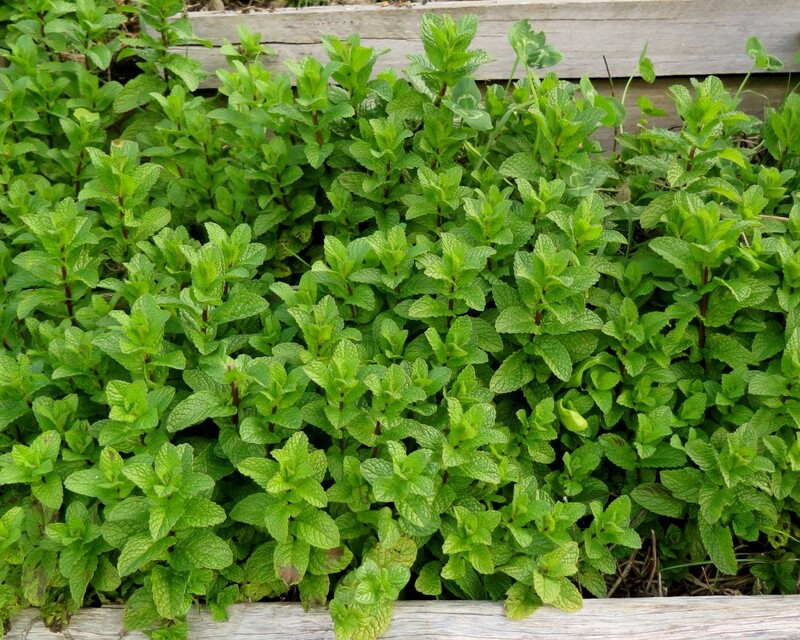 Mint is one of the essential herbs to have in your garden. However, left to its own devices it will *become* your whole garden. It has an enthusiastic character and strong vigor, meaning it can be everywhere in a blink of an eyelid. 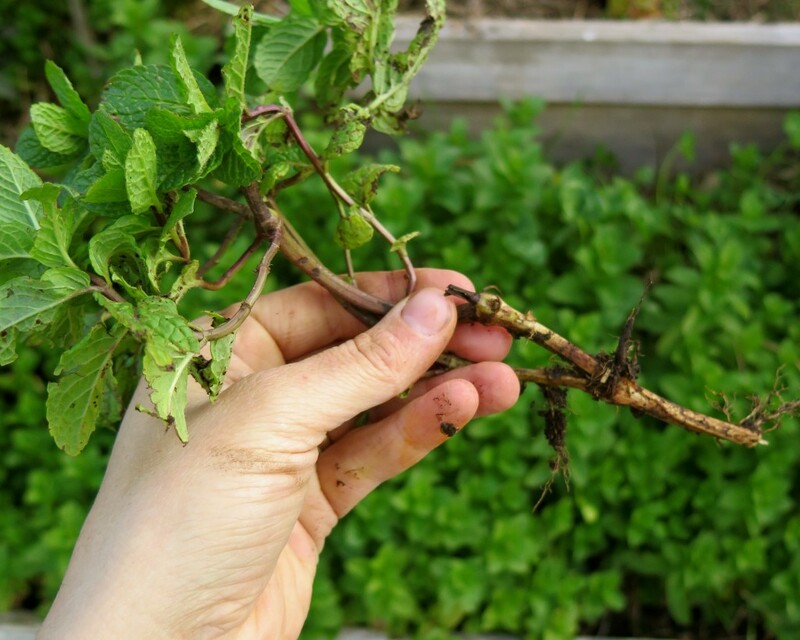 Mint has shallow roots which move outwards rapidly and send up new shoots of leaf as it goes – it can and will cover many square metres. 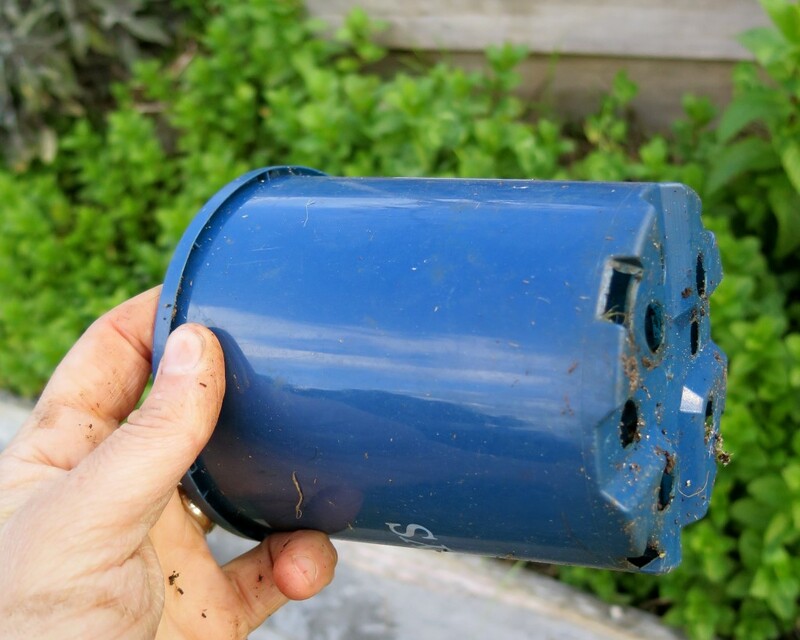 Often gardeners will combat this challenge by isolating it and putting it into a pot or container to keep it out of the main garden. 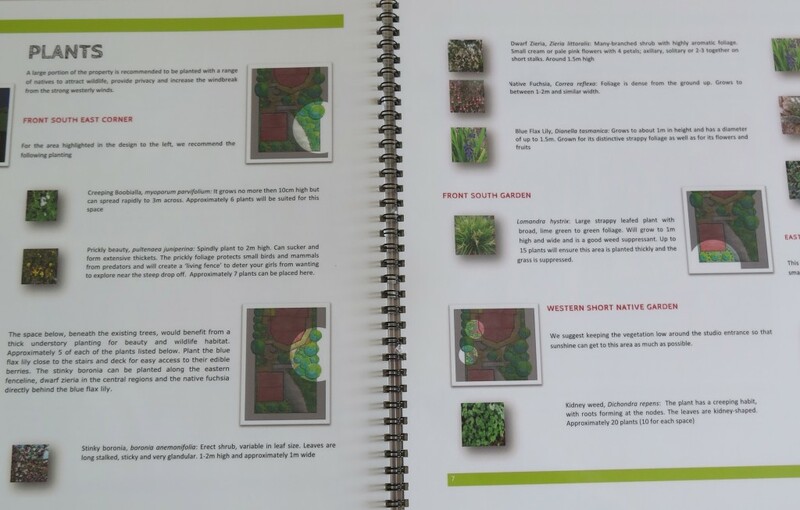 However through doing so you’re also keeping the plant away from the wonderful world of the soil food web – a world of biology in vast numbers doing all types of important things related to soil and plant health. Generally any plant in a pot needs higher levels of inputs to keep them happy. 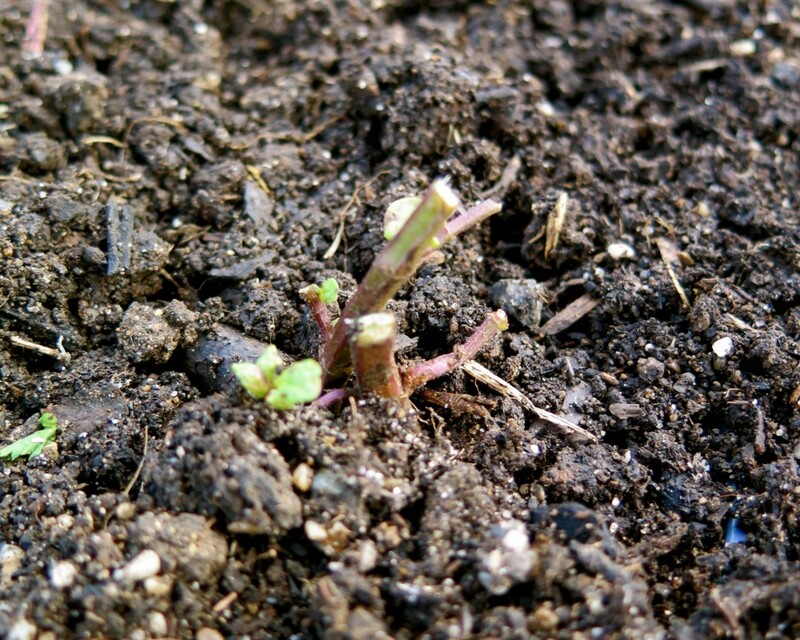 First we rip out a bit of mint from a patch in the garden (or your mate’s garden). You don’t have to be gentle with this plant, as long as you can get a bit of root on it, it will grow – guaranteed. Then, give it a drastic prune, cutting off most of the leaf and any leggy (tall) stems, this will ensure the plant puts the majority of its energy into establishing good roots over leaf. Next up, grab a plastic pot which isn’t overly precious. I’m using a small one here just to demonstrate the technique, but I recommend getting one which is 20cm-30cm (at least) in diametre so you can have a decent size plant. 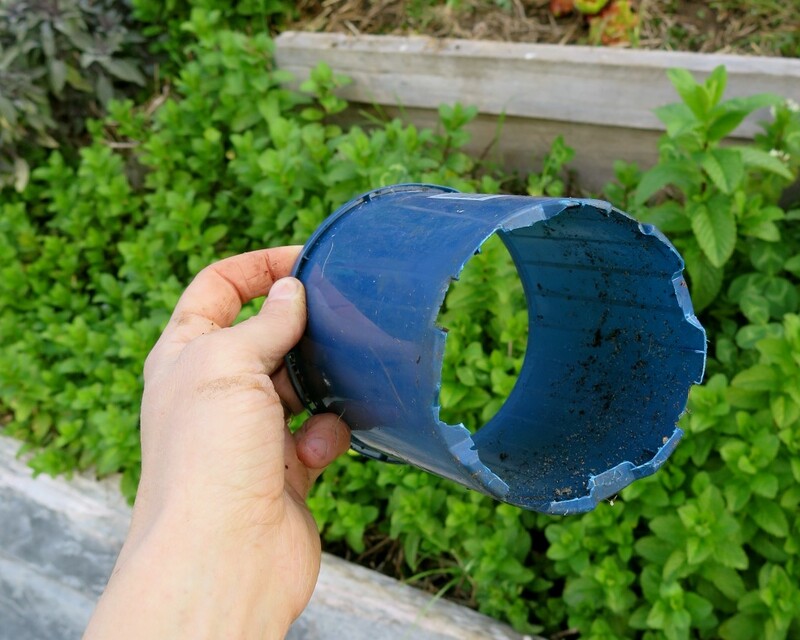 Cut the bum out of the pot – this will help the soil inside of the pot be ‘one’ with the rest of the garden soil. Then – press, wriggle and massage the pot into the garden bed of your choice until the rim of the pot is just below the soil level. Plant the mint cutting directly into the soil and cover the pot with soil so you don’t even see it. By doing this technique, you’re still allowing the mint to express its mint-ness. 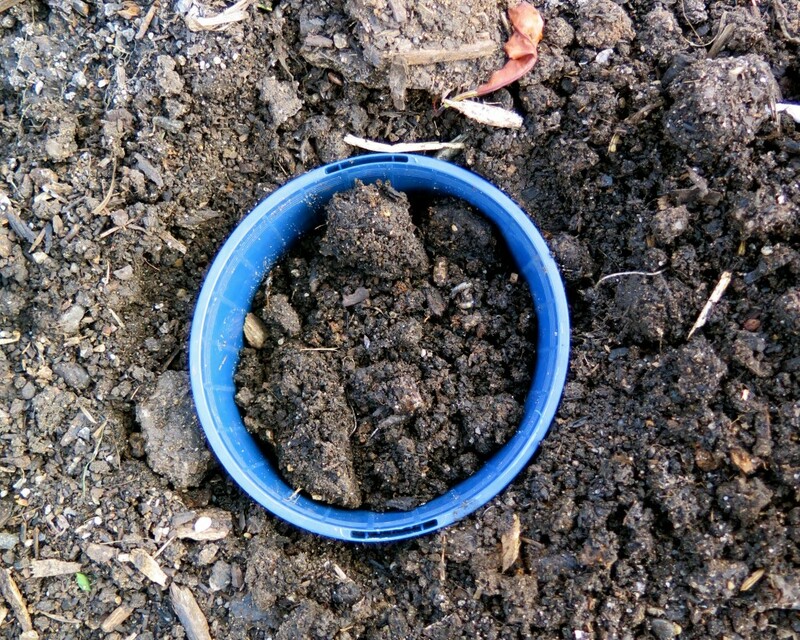 The roots can still spread outwards as normal, however the sides of the pot will stop them from spreading further. As the root’s natural behaviour is to grow close to the surface they will not dive down and under the bottom of the pot, they’ll stop there. 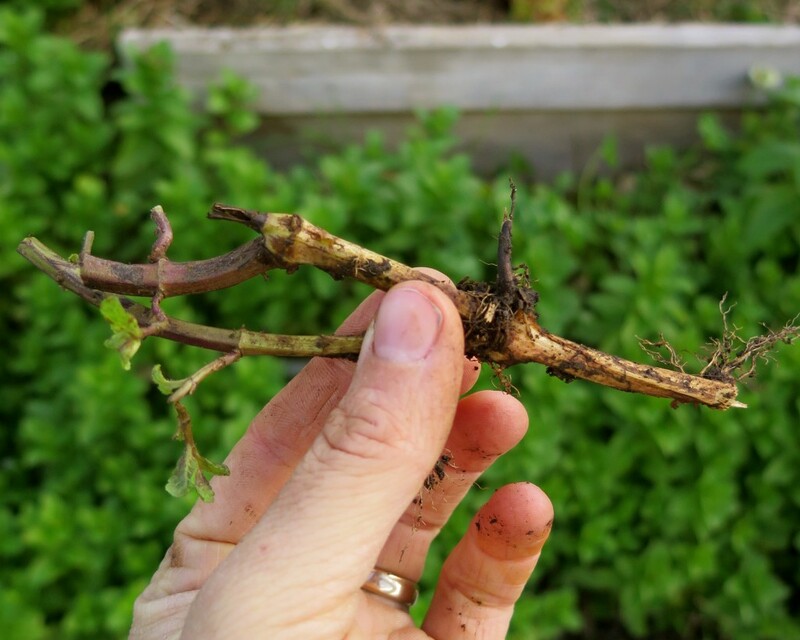 FYI – As part of ongoing management of this plant, you’ll need to pull out the pot/plant and prune the roots back every now and then as they’ll start getting root bound, circling in on themselves. So there you go, you can have your mint and vegies side by side, living happily ever after. Since late 2014, we officially started offering our design services to the world. While I’ve (Hannah) been designing since 2008’ish, I’ve only done so when there’s been time, or when people have (kindly) hassled me until I gave in. So it’s been a real pleasure to have rearranged life to make room for them to happen regularly. 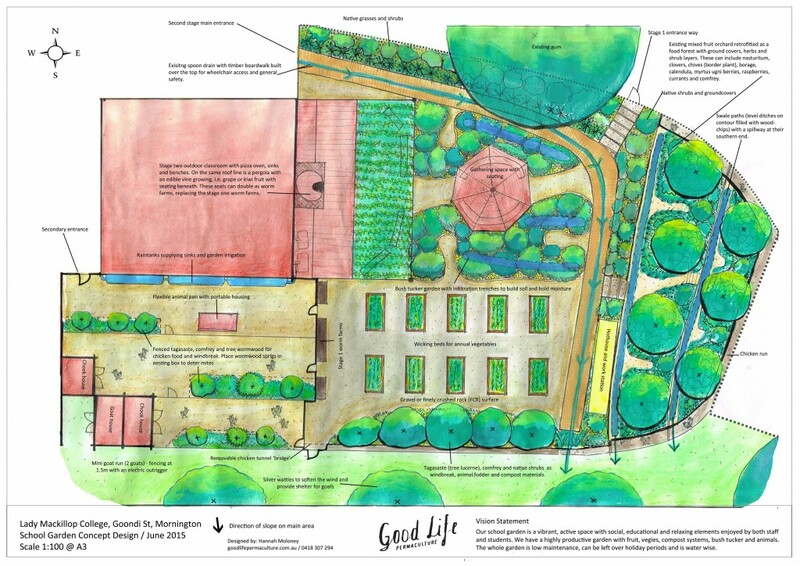 Helping shape landscapes and lives to be more productive, beautiful and abundant is pretty darn cool. We do small and large properties, everything from school gardens (like the one above) to private urban and rural properties. 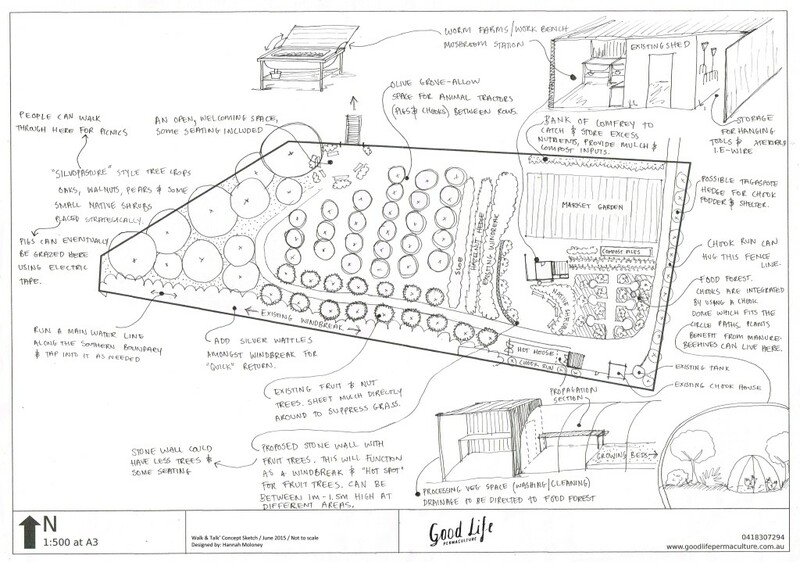 After years of working in public and private food gardens, it’s super satisfying to help create more and more productive spaces – you can never have too many! Each of our designs come with a report ranging from 5 – 30 A4 pages depending on the type of design service people choose. 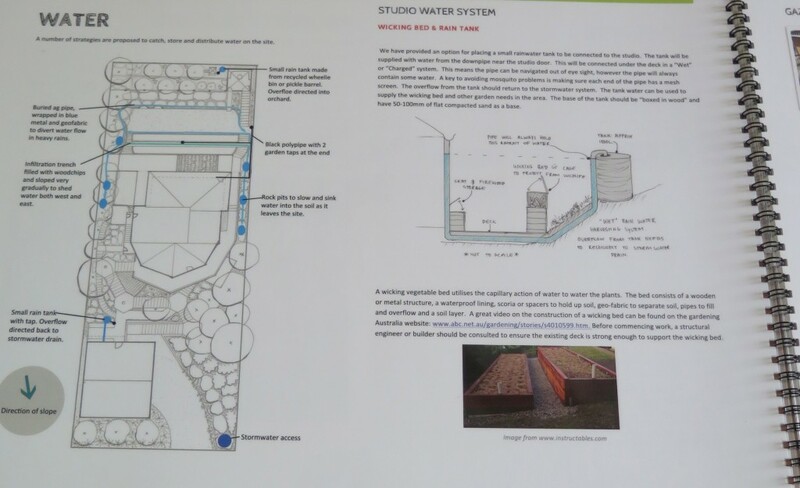 They’re jam packed full of information and detail, functioning as a guide for people to work from to implement the design themselves, or to pass onto contractors to do so. When we do full site designs we pull out all stops and create a tailored manual for people’s home. This is an A3, laminated (so it can hang out in the garden and get messy) bound ‘book’ which provides thorough plant lists, water maps, budgets, timelines of implementation and more. On some extra fun jobs, we partner with local building designer, Jane Hilliard from Designful. 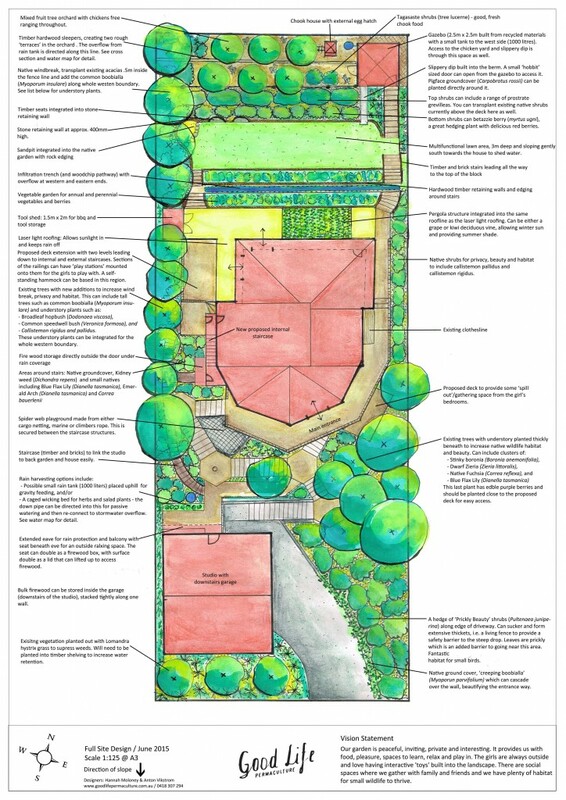 She designs the houses/structures and we do the landscapes – it’s the ultimate package, designing both the house and land to create a truly integrated, sustainable home. We can’t get enough of this type of design job – it’s incredibly satisfying as a designer to see people think and live in ‘whole systems’. And for people who just need a bit of support, or a nudge in the right direction we do Foundation Designs. 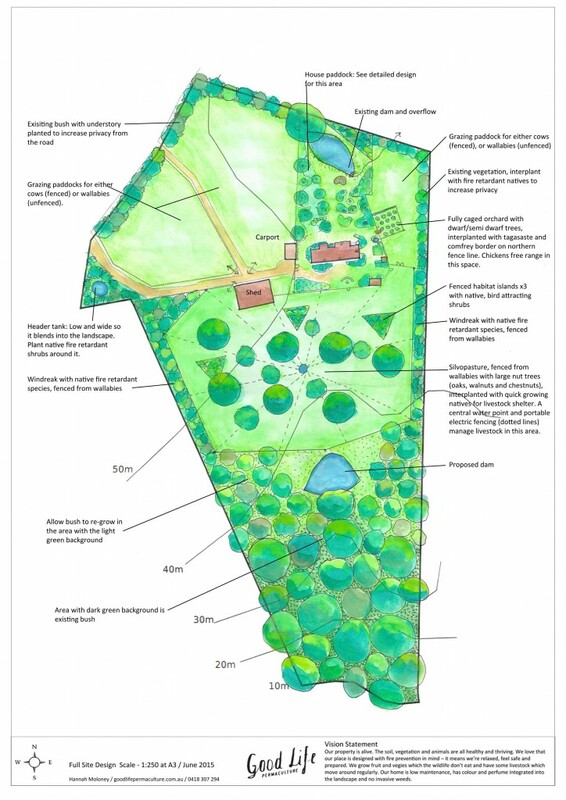 A real joy and challenge as a permaculture designer is finding the solution/s to the vast range of ‘problems’ that present themselves when working with landscapes and people. At the end of the day, there is always a solution – and often more than one! Do we really do all the designs by hand?? Yup, computer programs and me aren’t best friends. We do create our base maps using free software, Inkscape (read about how to do this here)- otherwise it’s just pen, pencil and water colour, we like a bit of ‘old school’. We also pop it into photoshop to write all the tex as my handwriting isn’t amazing. Do we implement our designs? We haven’t in the past as we’re pretty full and busy, so simply connect people with the professionals who can do it or support clients to give it a go themselves (whatever is appropriate for the context). However, we’re now looking to start offering implementation as an extension of our design services. So if you’re keen to have the whole sh-bang, just ask us and we can talk details. 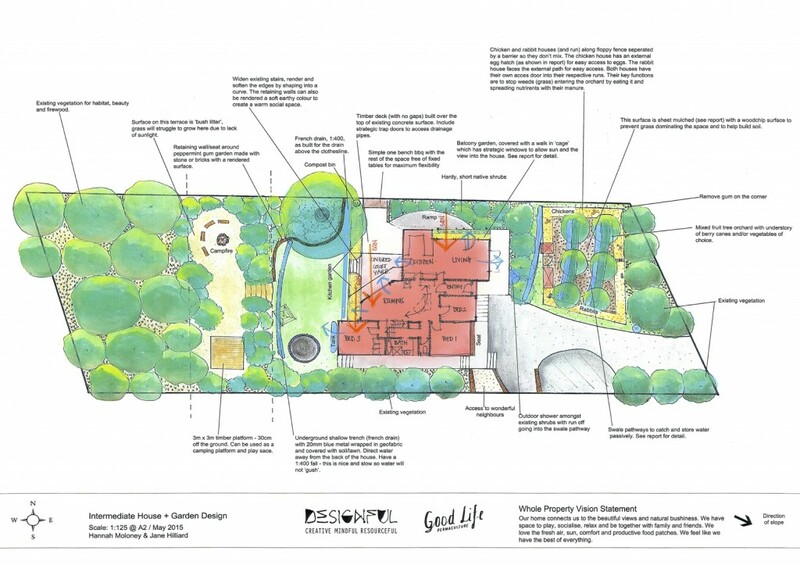 Want to learn how to be a permaculture designer? 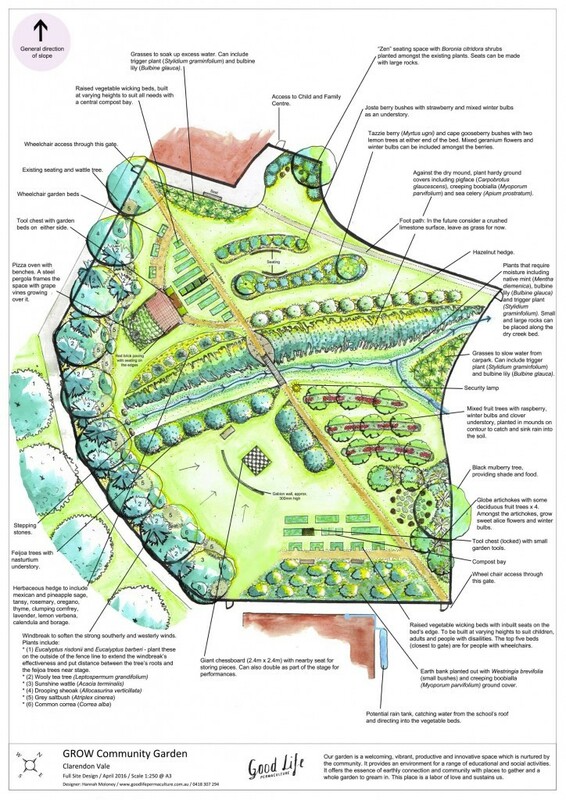 Find out when our next Permaculture Design Course is here.